The work isn’t fun, but living in a clean house is much more relaxing and enjoyable than avoiding certain rooms (dish filled kitchen or mile-high laundry?). When you want to get to that whole relaxation part quicker, it’s best to know the fastest way to efficiently clean a home. Whether you’re gloving up for an intense spring cleaning project or just trying to spruce up for incoming guests, use our tips for an easy cleaning experience. If house cleaning is more like a workout because your cleaning caddy is filled with spray bottles, disinfectants, and glass cleaner, it’s time to lighten the load. You’re making the right move to clean your home, but the products you’re using to wipe out germs and refresh the carpet are filled with harmful toxins – just check out the warning labels. 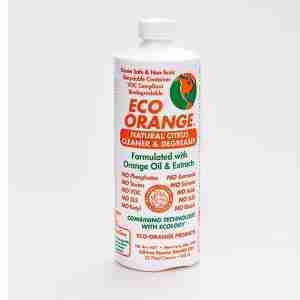 Opt for a toxin-free, biodegradable cleaner. (Capable of being decomposed by bacteria or other living organisms.) A concentrated all-purpose cleaner will eliminate the numerous bottles you’re lugging around, clean effectively, and protect your family and the environment. Rather than breaking your housework up by room, use our easy-cleaning method of performing one task throughout the entire house. It’s best to work from the ceiling down, cleaning carpets and vacuuming at the end of your cleaning project. Start with dusting the ceiling fans or light fixtures, then wiping glass and mirrors (tip: skip the traditional glass cleaner loaded with ammonia and use a concentrated cleaner that’s made with non-toxic ingredients). The carpet in your home can hold up to four times its weight in dirt (and anything else that gets stuck). A vacuum session isn’t going to handle that much buildup, so pretreat heavily trafficked areas with a concentrated cleaner that actually digests protein and organic stains with active bacteria produced enzymes. The cleaner will not only remove the stain, but you’ll also rid your home of the odor created by remnants of last night’s dinner, the family pet, or curious kids. As you move through the home, pick up commonly used toys that you know need to be cleaned. By using a diluted amount of a concentrated cleaner, you can soak the toys while you finish cleaning. Then, rinse with water, dry and the toys are sanitized and ready for the next play session. Don’t forget about the outside of your home. 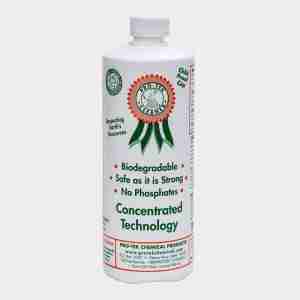 The biodegradable cleaner from Pro-Tek makes for easy cleaning when you need to scrub your grill, patio furniture, or remove the artillery fungus from your siding. With fewer products, you’ll move through your home easily to clean each area. And by using a kid and pet-friendly, non-toxic cleaner, you don’t have to push everyone outside to avoid chemical fumes as with other all-purpose cleaners. Learning the art of easy cleaning with an all-purpose cleaner will make your routine efficient, your home safe, and your time for relaxation a little longer.